This video is an example of how I use a story to market and sell what I do. 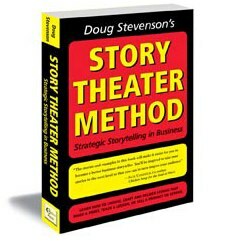 It also demonstrates my Story Theater Method in action. In other words, it is a strategically chosen, crafted and performed story intended to get a desired and predictable result. Which it does. The title of the video is: The Pill in the Peanut Butter. Since I have been using this video on the home page of my website, I have seen an increase in direct calls to my office off of Google and Bing searches. I have booked more business with people who have never heard of me before, than in the years before I used this story. If you want to learn how to use storytelling more strategically and effectively, call me. I inspire people with my stories and then teach and coach others on how they can use stories to improve their business results.